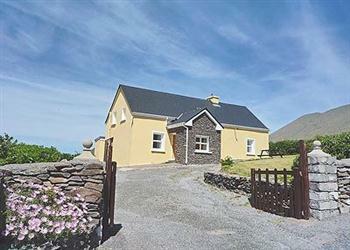 Balinavenourgh in Dingle, Co Kerry sleeps 6 people. Sea and mountain views. This traditional cottage is located on a farm in the most peaceful and picturesque part of Kerry. Majestic Mount Brandon stands behind the cottage and the views include the sweep over Smerwick Harbour and the Three Sisters. The cottage has been refurbished and the garden is perfect to enjoy the quiet, scenic surroundings. The area abounds with historic and archaeological sites - St. Brendan is said to have set sail from nearby Brandon Creek on his voyage of discovery of America. There is also a stone fort behind the cottage. This area is a walker’s paradise and also offers wonderful fishing and golfing opportunities. Sandy beaches nearby. Shops 3.5 miles, pubs and restaurants 0.5 miles. Ground floor: Living room. Dining room. Kitchen. 1 double bedroom. Shower room with toilet. First floor: 2 bedrooms: 1 double, 1 twin, each with sloping ceiling. Open fire in living room included. Oil central heating and electric by meter reading. Bed linen and towels included. DVD. CD. Microwave. Washing machine. Tumble dryer. Lawned garden with furniture. Ample parking. Holidays at Balinavenourgh run from Monday to Monday. For a better idea of where Balinavenourgh is, you can see Balinavenourgh on the map below. Do you want to holiday near Balinavenourgh (W31355), you can see other cottages within 25 miles of Balinavenourgh; have a look to find your perfect holiday location.